Comment: A copy that has been read, but remains in excellent condition. Pages are intact and are not marred by notes or highlighting, but may contain a neat previous owner name. The spine remains undamaged. An ex-library book and may have standard library stamps and/or stickers. At ThriftBooks, our motto is: Read More, Spend Less. 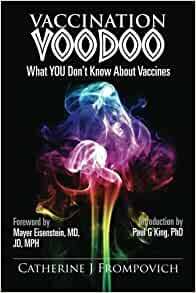 Vaccination Voodoo uses peer reviewed journal studies, U.S. health agencies information, and other documentation to disclose what's in vaccines that consumers, unfortunately, do not know. Vaccine ingredients can include such components as Thimerosal, which is 49.6% ethylmercury, aluminum, 2-Phenoxyethanol, formaldehyde/Formalin, polysorbate 80, phenol, antibiotics, gluteraldehyde, MSG, sodium borate, plus a 'shopping list' of other neurotoxic chemicals, along with vaccine production media that includes anything from monkey kidney and other animal tissues to genetically engineered insect virus to diploid cells, which are aborted human fetal tissue. Surely, vaccines are not just an antigen and saline water, as many health professionals would have you believe. The book discusses adverse effects from vaccines both in trials, and in foreign countries where vaccination campaigns are being closed down by governments due to so many adverse effects from vaccines--something the U.S. media doesn't report. Vaccination 'politics' and how they affect everyone from the newborn infant to senior citizen become apparent with the author's candid discussion of what her research of vaccines since the 1980s has uncovered. Many of the myths revolving around vaccines and vaccinations are exposed for what they truly are, public relations and media spin. Vaccination Voodoo, What YOU Don't Know About Vaccines will open readers' eyes to information they should know and utilize as part of being informed healthcare consumers. Catherine J Frompovich has been a consumer health researcher and advocate since the late 1970s. She was in the vanguard of the health and wellness movement based on holistic health principles; natural, nutritious foods and diet; complementary and alternative medicine (CAM); and the wisdom of health and healing as passed down through the years from various cultures. Now, mainstream science and medicine are beginning to agree with some of Catherine's convictions. Catherine always has been an advocate in favor of a person's birthright to the care and treatment of one's health and one's children's health as he or she desires. Nothing is more personal. Catherine is the author of numerous books dealing with health, wellness, and nutrition since the 1970s. Several of her books are on Amazon.com now. I hesitated to buy this book because of the title and cover. I thought it would be full of wild hype like some anti-vaccine books. Nothing could be further from the truth. It's an amazing, breakthrough book. It's chock full of facts, references, links and quotations from the vaccine makers, government officials, doctors and parents. In their unguarded moments, doctors say things that could have the rest of us facing a judge and jury. * The US Congress gave vaccine makers a get out of jail free card which encourages the explosive growth in new vaccines and a US Vaccine Court awards damages to (some) parents whose children are hurt, with gag orders attached. * The FDA has approved insect growth media, like caterpillars, to grow the vaccines in. * There never has been a double blind placebo controlled trial for vaccines. Instead of a real placebo, they test against other vaccines. * A law for comparing Vaccinated and Unvaccinated populations was taken to the US House by Carolyn Malloney (D-NY) in 2007 but wasn't voted on. Neither was the Healthcare Rights Amendment voted on (adding to the Constitution). * Doctors have known for years that the Gardasil HPV vaccine given to young girls can kill or turn its victims into health cripples. * The major diseases were in steep decline towards zero due to better housing, sanitation, food, etc. before vaccines were brought in. Then the doctors claimed that they wiped out the diseases. * At the "Simpsonwood" meeting in 2000 made public by Robert F. Kennedy Jr., 52 government, vaccine and health care experts discussed a study which clearly showed the link between vaccinated kids and the deteriorating health of children. Then they decided how to cover the story up and bury it. * The vaccine makers have plans for 300 new vaccines and government has plans for an RFID microchip to be implanted in the palm of the hand to "track" citizens. Bottom line: a valuable, helpful book. 5.0 out of 5 starsWe Should be Improving Our Lot Shouldn't We ? As the years go by I have become more and more suspicious of vaccines. Back in the 50s when I was growing up we had few medications and even fewer needs for them. A disinfectant (Dettol or Iodine), a cover (Elastoplast) and a pain killer (Asprin). After 67 years most of the childhood diseases seem to have passed me by. It seems that my immune system must be intact. Not so my heavily vaccinated grandchildren who at the age of 5 or 6 can name multiple antibiotics and seem to be forever a little under the weather. Too much of the book is too close to the truth within modern society for anyone to remain comfortable when reading it. There is definitely something amiss when the experts nearly blow a valve when insisting that kids and older folk are vaccinated or fluoride is put in our drinking water. Whatever happened to homo sapiens ability to think critically ? Thank you Catherine for an excellent read. Catherine has hit this ball out of the park! Vaccination Voodoo is the best read on the market today which informs readers as to what exactly is in vaccines and why these ingredients are toxic and destructive to our immune systems. God gave us immune systems to keep us healthy. Then He placed us in a Garden and meant for us to feed ourselves and heal our diseases with the nourishing food found in it. Vaccines actually by-pass our immune systems and make us weaker and sicker in both the short run and the long run. Vaccination Voodoo explains how and why this happens. Thank you Catherine for your excellent book. If only it were required reading in medical schools! A must for anyone who wants more information about vaccines. In "Vaccination Voodoo" Catherine Frompovich does a superb job of citing reputable sources to expose little known facts about vaccinations. Her academic treatment of the subject illustrates how the long held glorification of vaccination is far more "tradition" than sound science. By accessing independent, peer reviewed research as opposed to research done by the vaccine pharmaceutical industry, this author exposes shocking and disturbing information regarding the assumed safety of vaccines. This is a must read for parents seeking accurate information about the controversy surrounding vaccines. It is assumed that giving infants 9 vaccines at one time is safe, however, no studies have been done nor published which support that hypothesis. Parents trying to decide where they stand on vaccinations will find this book instrumental in providing a much more comprehensive picture than they will ever get from mainstream media or even their pediatrician! Catherine has done her homework very thoroughly and the information is well referenced using sources such as NIH, CDC, The Lancet and JAMA, as well as independent researchers who hold MDs and PhDs in their respective fields. There is an alternative to vaccinations. Perhaps parents will consider a different option as a prophylactic measure for ensuring the health of their children after reading "Vaccination Voodoo." My book, "The Solution: Homeoprophylaxis - the Vaccine Alternative," available on Amazon.com, is an equally eye-opening read that shows how reinforcing and "educating" a child's immune system plays a huge and natural role in disease prevention and positive long-term health outcomes.